Of all the GOP candidates to take the debate stage on Tuesday night, Florida Sen. Marco Rubio will be the one to watch. Yes, that Rubio — the Rubio who has come under fire for his alleged use of business credit cards for personal transactions, who has been criticized by his opponents as being a moderate (of all things), and who was recently accused of missing far too many Senate votes to be considered a viable presidential candidate. Here's why he's still so important. The GOP has long desired an alternative to President Obama — or rather the conservative counterpart to 2008 candidate Obama. 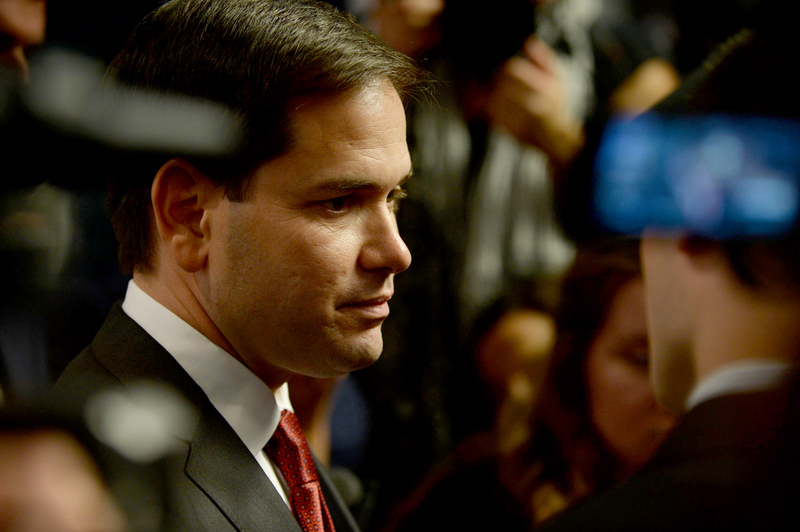 Rubio, for all intents and purposes, fits that mold in every way that matters. He's young, he's new(er) to the national political stage, and more importantly, he's a minority. Couple that with the fact that he's got the wherewithal to answer questions coherently and not put the audience to sleep at the GOP debates, and you've got the perfect candidate — one that can incite the same sort of passion and excitement among the party that Obama managed seven years ago. Unfortunately, even the most elaborately vetted responses and the toothiest smiles can't quite cover up a scandal — especially when that one scandal snowballs into two, three, or four (or, in Ben Carson's case, a baker's dozen — which is an exaggeration, but not by much, poor guy). And despite the fact that Rubio's latest credit card dilemma isn't quite the incendiary issue that some are making it out to be, it's still going to pester him in the weeks to come. Thankfully for the Republican Party, the junior senator is taking it in stride. "The Republican Party never paid a single personal expense of mine ... [but] when this was initially reported in the press, it was made into something bigger than it actually is," Rubio said in an interview with Good Morning America on Wednesday. "I wouldn’t do it the same way again to avoid all these stories but the Republican Party never paid any of my personal expenses." The credit card inquiry hit Rubio just as he was recovering from heavy criticism that he simply wasn't doing his job in Washington. How, many outlets asked, could someone who missed 99 Senate votes since the beginning of January be expected to adequately run the entire country? Don't worry — baby-faced Rubio had just the right answer for that too, or at least one that might buy him some time with his supporter base. "In 2008, Barack Obama missed 60 or 70 percent of his [Senate] votes, and the [media] endorsed him," Rubio replied sternly when asked by CNBC debate moderator Carlos Quintanilla about his notable absences back in October. "So this is another example of the double standard that exists in this country between the mainstream media and the conservative movement." It wasn't enough of an answer to keep the reporters off his trail, but it was the perfect response to buy Rubio the support of the party's right wing, which has long detested the mainstream media for supposedly veering too far left of center. Rubio's ability to sidestep those scandals with just enough defensive finesse to keep him in the GOP's favors, while simultaneously aiming his ire at those outside the Republican field rather than his fellow candidates, has seemed to yield tangible results in the polls: In a Monmouth University Poll put out on Nov. 2, Rubio's numbers had jumped high enough to bump him into third place in the New Hampshire primary. According to a Real Clear Politics average, Rubio had garnered some 11 percent of the prospective vote, up 5.7 percentage points since his last big slump in mid September. Whatever Rubio's doing, he needs to keep it up. Although his early luck quickly diminished under the shadow of more outrageous candidates like Donald Trump and Ben Carson, the fresh-faced senator has somehow managed to claw his way back to the top — or at least the ledge just beneath it — a feat that's rarely accomplished past the mid-mile marker along the election trail. At the fourth GOP debate on Nov. 10, you can be sure that the rest of the Republican field will either be watching closely and taking notes, or carefully crafting a plan to take him down. Either way, it's sure to be an exciting night.